Food Costs > How Much Does a Cotton Candy Machine Cost? How Much Does a Cotton Candy Machine Cost? Cotton candy, a form of spun sugar that is mostly air, is also referred to as candy floss or fairy floss. It is often served at carnivals or circuses, but it can also be a fun addition to parties and celebrations. While cotton candy can be purchased pre-made in stores, there is nothing like fresh cotton candy right out of the bowl. In order to make this, you will need a specialized cotton candy machine. Cotton candy machines can commonly be found at local retailers such as Target and Sears. The price for a small machine that sits on top of the kitchen counter can be anywhere from $25 to as much as $65. Industrial cotton candy machines, on the other hand, can retail for $260 to as much as $1,500. These are the machines that you typically see at sporting events or a carnival food stand. CottonCandyExpress.com, a website that sells everything cotton candy, has a wide variety of machines available for purchase. Their commercial machines range anywhere from $960 to as much as $1,500. Entry level machines can retail for $500 to as much as $800. Do keep in mind that these commercial machines are going to be a lot more efficient than your on the counter kitchen machines. The Nostalgia Electrics PCM-805 has over 195 great reviews on Amazon, and this machine, in particular, retails for $35 to $55. Cotton candy sugar packs can come in flavors that include vanilla, cherry, blue raspberry, vanilla and more. 12 ounces of sugar can generally yield around 30 servings. On average, each serving will cost around $0.20 to $0.40 to produce. Most cotton candy machines are going to work in the same manner. Upon starting up the machine, simply pour the candy and sugar in the center of the machine. As the machine spins, the sugar will be transformed into a delicious cotton candy. Depending on the size and purpose of the machine, it may come atop a cart with wheels. This will allow you to easily move the machine while you sell your cotton candy. Cotton candy sugar, also known as “sugar floss,” and cones will be needed to create the cotton candy the right way. Cotton candy sugar can be purchased separately or in packs. On average, plan on budgeting around $3 to $7 per 12-ounce container. For those that want to sell the cotton candy, a floss tree can hang the cotton candy while you wait for it to sell. Aside from purchasing the cones, it is best to purchase a plastic bag that can wrap around the cotton candy to keep it fresh. 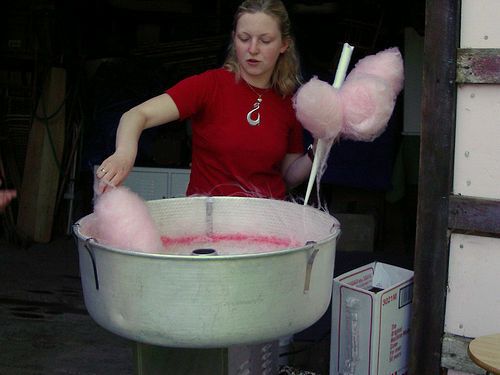 For commercial grade machines, some attachments can be purchased separately such as a bubble to prevent the cotton candy from being exposed to the air. Larger machines can often incur higher shipping prices. You may also need to hire someone to assemble and install the machine in the location of your choice. Cotton candy is naturally white in color. You can either purchase different flavors of cotton candy sugar mix or you can simply add food coloring. While this will not add flavor to the cotton candy, it will make it different colors. For those that are on dietary restrictions, do keep in mind there are sugar-free cotton candy mixes out there that can be used. Heavy commercial users should closely look at the volume a machine can produce. All machines are not created equally when it comes to speed. If you are planning to use the cotton candy machine to sell the cotton candy, you could potentially earn back the money that you spent on the machine itself. If you are just going to use this machine for fun, consider getting an on the counter machine for less than $50. While the cotton candy will not be amazing and will take a longer time to make a large amount, it will get the job done. If you want a machine for events or for bulk cooking, then it would probably be wise to purchase a commercial machine. Consider purchasing a combo kit that includes everything from the sugar to the machine. By doing so, you can save upwards of 30% depending on the retailer. With so many brands out there, be sure to compare at least three to five different models. Do not go with the price alone, however; be sure to read the description, know of the speeds and also look at what other buyers are saying. Look for used cotton candy machines on sites such as eBay and Craig’s List. Amazon may even have some used ones available. A cotton candy machine is one of those items that people purchase with good intentions but then never use. Therefore, most of the used machines will probably be in pretty good condition.